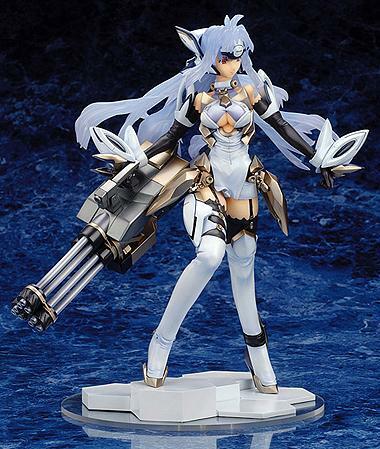 NCS expects to restock the Xenosaga KOS-MOS ver. 4 this week and preorders will ship once our allotment arrives. «©NCSX» Alter's original KOS-MOS toy as sculpted by Takahashi Tsuyoshi from 2005 was one of our best sellers and we would have sold more if stock was available. Alter re-released the figure in late 2006 and those sold out fairly quickly as well. Since you can never have enough KOS-MOS, Alter unleashes a KOS-MOS Version 4 figure which is based on her incarnation in Xenosaga Episode III. Akin to the first figure from Alter, KOS-MOS' hair is a translucent blue color that trails away from her head with wild abandon. It's as if gale force winds were blowing. Her armor is a mix of lingerie, garters, and metal plates which leave little to the imagination. On the weapon side of things, KOS' right hand hefts a nine-barrel Gatling gun which is almost as tall as she is. The figure is set to 1/8 scale and measures 21cm (8.26") tall. The sculpture is by Yagyu Toshiyuki and we consider ver. 4 to be something of a masterwork. We recommend shipping via UPS ground for our customers within the United States as this item will incur dimensional weight of 7 lbs due to the size of the item and packaging. Thanks. View larger photos on the main NCSX website.